Here's a fun way to send a birthday present if the recipient lives far away....birthday in a box! Our son celebrated a birthday recently and since we couldn't be together I sent his gift in this box I put together. Instead of using packing peanuts or bubble wrap I used balloons. (These had his name on them but solid balloons would look great too.) Just blow them up partially so they are small and nestle the gifts in with some shredded paper. 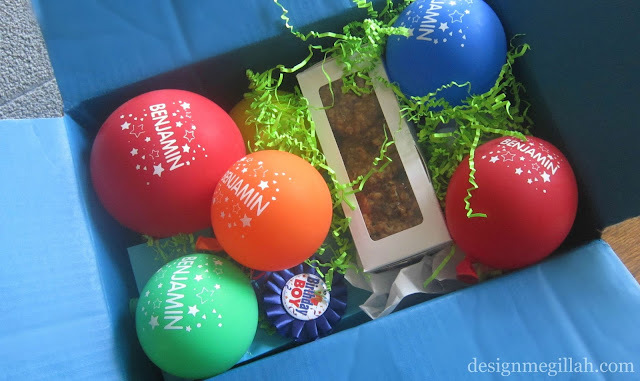 The balloons keep the gifts from shifting around in the box and protect them from being bumped around. Wouldn't you love to get a package in the mail and find this on your birthday?